WFAE reporter David Boraks joined “All Things Considered” host Mark Rumsey to discuss the merger. Mark Rumsey: Was this a surprise? David Boraks: Yes, to many of who us who have followed these two banks for a long time. One analyst I talked to used the word "shock." The Atlanta Journal-Constitution called it a "stunning announcement." In Charlotte, people are buzzing about this new corporate headquarters that seems to have dropped out of the sky. Boraks: It's been a decade since Charlotte had two large bank headquarters. The city was the nation's Number 2 banking center before Wachovia was swallowed up by Wells Fargo. But it has continued to grow in importance — with major operations here for Wells Fargo and Ally Bank, the headquarters of online lender LendingTree and a lot of related financial technology businesses. Rumsey: How was the news received in Winston-Salem and Atlanta? Boraks: There's also a lot of disappointment in Atlanta. To many, it was a reminder of the merger mania of years past, when banks like NationsBank, First Union and Wachovia gobbled up Atlanta's banks. SunTrust was founded there in 1891. Atlanta news media are pointing out that they'll have to change the name of SunTrust Park, where the Braves play. And by the way, this also means new names for BB&T Ballpark in Charlotte and Winston-Salem. The upside is those stadium deals mean the new name will be on the tongues of thousands of sport fans. Rumsey: Speaking of names, they say they'll pick a new one for the combined bank. Why? Boraks: A couple of reasons. By opting for a new name, they're standing on equal footing — and avoiding a fight. 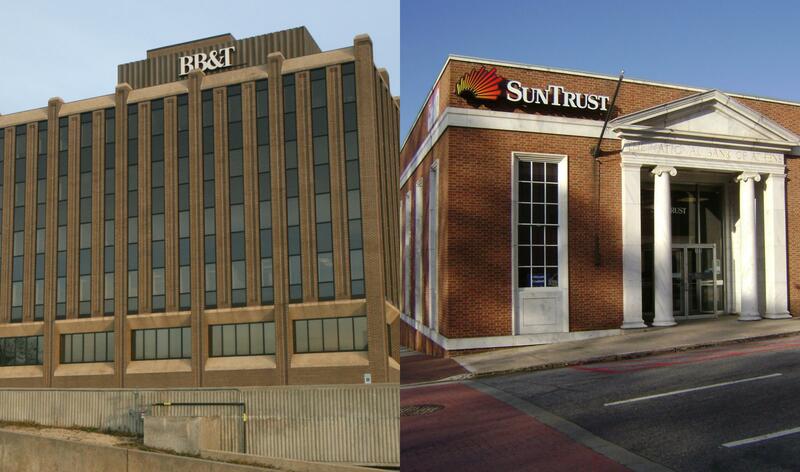 In the conference call with analysts this morning, both BB&T CEO Kelly King and SunTrust CEO Bill Rogers described this as a "transformative deal." They want to signal to investors and to customers that this will be a different company. So, time for a new name. Rumsey: So, why is this happening now? Boraks: Another reason is technology, which is expensive and changing quickly. The companies both say they want to improve their use of technology to serve customers better. They said this morning they're planning to spend an extra $100 million a year going forward on technology. Much of that will come out of Charlotte. In addition to the headquarters, the companies plan an expanded Innovation and Technology Center here. Rumsey: Are these two companies a good fit? Any worries about this deal? Bush says BB&T was largely built by a strong CEO, John Allison, who retired 10 years ago. The culture he built is strong and intact. She says SunTrust has struggled over the years with clashes between its different geographies, and between pushing a retail culture versus a corporate culture. We'll see how those come together when they start making personnel decisions. Rumsey: So, is this a huge regional bank, or a national bank? Boraks: Great question. I'd put it in the large regional bank category, but one with national aspirations. They'll be in 17 states and the District of Columbia — but nothing west of Texas and Indiana. Together, they'll have $442 billion in assets. But that's still a lot smaller than the top four banks, which all have over a trillion dollars. It's still about one-quarter the size of Bank of America and Wells Fargo. I guess a big question is, will there be another big deal someday to take them coast-to-coast?